Thorlos are one of the most popular socks for outdoor activities, particularly hiking, backpacking and other active summer uses. One reason for their popularity is due to their use of “Coolmax” which greatly help prevent stinky feet by keeping the foot cooler and dry. However, Thorlos aren’t just for warmer weather uses. There are several styles of Thorlos that work well for colder, winter weather. The hiking crew thick cushion sock is a very suitable sock for winter weather. While this sock isn't as soft or snuggly as SmartWool socks are, they still work well in keeping the feet warm during cold weather. The sock is also very durable. Since it made from acryllic, it doesn't wear out as quickly as SmartWool socks can. This sock is for both men and women. Thorlos has a large range of what I call "specific activity socks." There are a full line of Thorlo socks designed for running, tennis, casual wear, hiking, the office and much more. The many socks offered by Thorlo are more than marketing gimmic. While I much prefer Smartwool socks for winter weather use, for summer use I wear Thorlo walking crew socks almost exclusively. Why? The Thorlo summer crew socks unique design allows all foot sweat to escape from the shoe. This may not sound too exotic. However, the perspiration (sweat) of a foot being "stuck inside the shoe" is what leads to stinky feet. When a Thorlo summer/warm weather crew sock is used with an athletic shoe that is fully breathable, the "stinky feet" problem often encountered during the summer months goes away. Ever since I started wearing this great sock (combined with a breathable running shoe from New Balance) during the summer, all foot smell problems have disappeared. My feet have been dramatically cooler and have never felt "slimy." 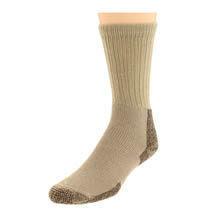 If you want a good all-around use "warm weather sock" that keeps your feet cool and "stink free," you'll be hard pressed to find a better one.